Candy Cane Hot Chocolate Blocks - Christmas Handmade Idea | gingerbread smiles. Following on from yesterday's post, I've got another homemade Christmas gift idea featuring today! To go with the mugs we created for our family, we decided to create little blocks of chocolate to make a special hot chocolate. To make these little blocks, simply melt the chocolate, either in the microwave or on the hob over some hot water. Once melted pour into the mould. 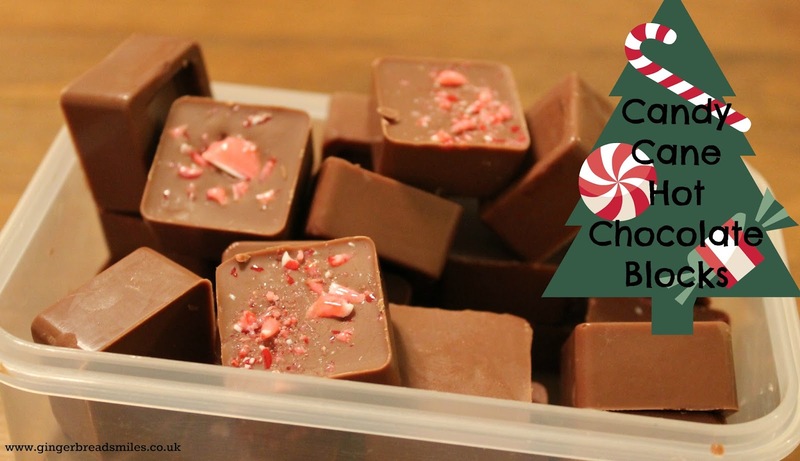 Smash the candy cane in a plastic food bag or under some cling film with a rolling pin or something else heavy, then sprinkle over the chocolate in the mould. If you aren't keen on peppermint don't add it, simply keep it plain or add another flavour like marshmallows. When you are happy with your coverage, stick this in the fridge and leave it overnight. It should be completely solid when you remove it from the fridge so you can take them out of the mould and wrap up for friends and family. We used some clear plastic wrap (like the kind you use for hampers) and some pretty Christmas string. Its also a good idea to add a tag so that the recipient knows what to do with the blocks. This looks really cute and is perfect for a stocking filler. Stay tuned for tomorrow's blog post which will show the complete homemade gift idea!